We've been intrigued by WowWee's Coji the Emoji robot from the first time we heard about it. Emoji's are popular with kids and tapping out programs by touching Emojis is a fun idea. We've now had chance to play with our Coji and can explain how this works in practice. Coji is aimed at children from age 4-7 though we think the upper age limit is higher than this. 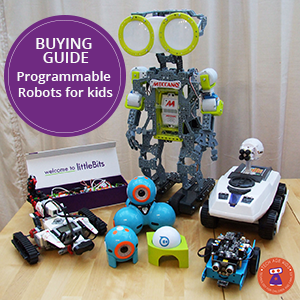 It's not just suitable for little kids, the robot is cool enough and challenging enough for tweens, and lots of teens and adults would have fun with it too. Coji does a good job of appealing to a range of abilities with different directed activities and plenty of scope for self-directed activities. It's worth noting that Coji has only just become available, we may well see updates and improvements to the Coji app before Christmas. We'll update this article if significant changes happen. Coji is a cute little robot which moves around on two wheels. Coji's key feature is that it has a screen for a face. The screen is bright and colourful and plenty good enough for displaying Emojis and animations. 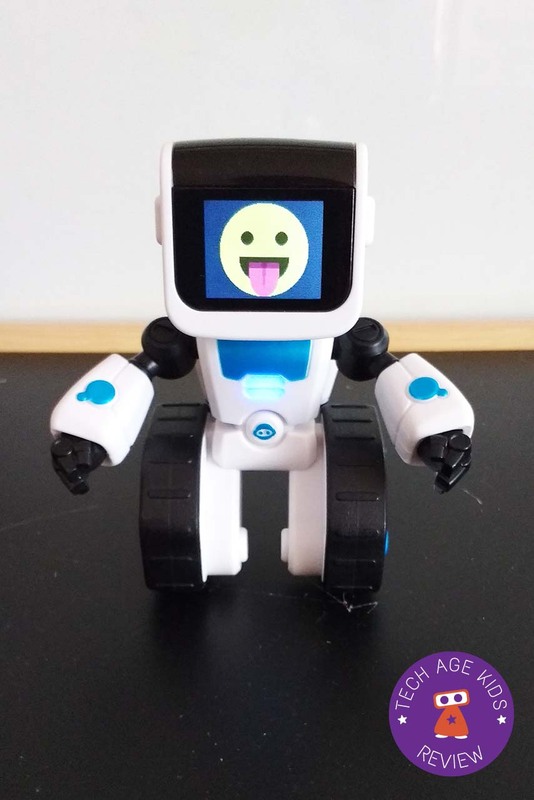 We love the appearance of Coji, the only negative is that like pretty much all robots for kids, Coji uses blue as the main detail colour. There are so many colours, why choose the one that's identified with boys? The rest of the product isn't at all boy oriented so this use of blue seems like a shame to us. Coji also has a speaker for playing sound effects and sensors so he can tell when he's picked up. Coji takes 3 AAA batteries and has a simple on/off switch. The decision to use batteries rather being USB rechargeable probably keeps the cost down. Update: Coji's RRP is $59.99/£59.99 but we're seeing deals a lot lower than that which makes it a great buy. Without the app Coji can run some simple programs which can be selected by pressing the buttons on the sides of his head and then pushing the button down. Coji will also react to being moved - it has motion sensors which can detect movement and shaking. Once kids get a bit more advanced with Coji they'll be able to download their own programs (macros) to Coji for use on disconnected play. Coji is very much a connected toy, most of the behaviour is accessed through the app, but we really like that WowWee have included some disconnected play too. The Coji app is available for iOS and Android. 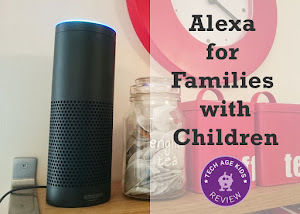 Coji uses the newer Bluetooth Smart system and WowWee have done a fab job of making it easy to connect with. You just turn on the app and it automatically detects Coji, you just tap on the robot to connect. This is quick, easy and reliable and it's really easy to switch between devices. 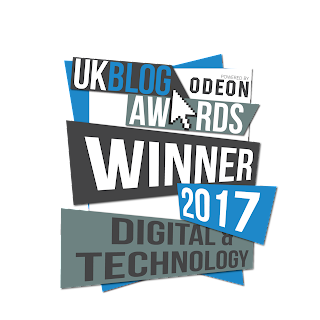 This may sound obvious, but it our experience it's something that doesn't always go smoothly and WowWee has got this right. Coji actually has several different interaction modes which will appeal to different kids and at different times. Some are more focussed on fun while others require some serious brain power! In drive mode, Coji can be used as a remote control toy with an onscreen joystick. Additional buttons allow Coji to display Emojis as well as moving around. This is a simple feature, but a good one and it works well. Sequence is a memory game that shows a sequence of Emojis on Coji's face that kids must repeat on their tablet. This game is actually pretty hard! You're having to look at Coji and then tap the symbols. Sequencing commands together is an important coding skill. It's not clear to me that this activity builds that skill (though other Coji activities certainly do) but memory skills are very useful to develop. Macro Maze is a guided activity where kids have to use motion commands and Emojis to guide an onscreen Coji through a maze. It's important to understand that the Coji robot doesn't follow these instructions, instead it acts as a companion and rewards kids when they complete a level. 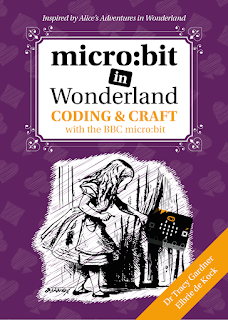 The format will be familiar to kids who have used Code.org and other coding apps where kids must write code to get a character through a maze. You can complete levels a little bit at a time which makes the activities manageable. Kids who are ready for the challenge can write the code for a whole maze in one go, but others can break it down into smaller parts and solve them one at a time. The twist here is that the levels are timed. This does add some extra difficulty as kids who are just using trial and error will run out of time. There's also some problem solving built in, you have to use the right Emoji to remove obstacles that are included in the mazes. My 9 year old was able to easily complete the activities but he did have to stop and think about the obstacles and had to up his game to complete some of the harder levels within the time limit. I can see that children with less experience would have to work quite hard to get through some of the levels. It would be good to have the option for Coji to actually follow the instructions as well as the onscreen robot. At the moment the Coji doesn't have much to do during this activity. You can't use this activity without Coji turned on though - it just goes back to the start screen if you turn him off. I think Freeplay is where kids will spend most of their time with Coji in the long term and where most of the learning will happen. In this mode you can code a series of Emojis and then send your program to Coji. Each Emoji triggers a behaviour which can include movement, sound effects and an animation on Coji's LED screen face. For example the flower Emoji makes Coji move forward, sniff a flower which appears on the screen and then sneeze and move back. Coji responds as if you're having an instant messaging chat. This may be familiar to some kids who use kids messaging apps, but for others this will be an introduction to instant messaging and the use of Emojis. This is fun, but it would be nice to have an option to turn it off so that a child can just concentrate on what they are coding or take turns with a real coding partner. When we've had two kids playing with Coji they naturally want to take turns controlling Coji and sending it back and forwards between them with a message. Coji encourages kids to get up and move around because you can only see the Emojis when Coji is facing you. The robot doesn't work so well if kids just stay sitting in one place. Additional Emojis are locked at the start, but we haven't managed to unlock them yet despite my son completing all of the Macro Maze levels. At the moment the app seems to ignore repeats of the forward and backward commands, only moving forward or backwards once. This is confusing as this is a very common pattern in the Macro Maze activity. You can get around it by placing other Emojis in between the forward and backward ones, or using other Emojis such as thumbs up and down which also move. 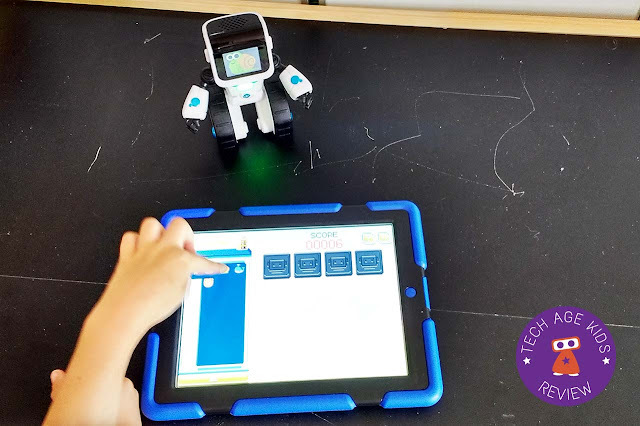 The Command Centre allows kids to create 'macros' that capture a sequence of commands that can be used to create a sequence of commands that can be reused. Each macro is assigned a number and you can use macros that you have defined in freeplay mode. It would be nice if macros could be assigned an image instead of a number as that would be more memorable and more in keeping with the Coji concept, this could easily be added in future though. The macros can be downloaded to Coji so that they can be used when Coji isn't connected to the app. Triggering actions based on events is also indicated in the promotional information about Coji so you should be able to say if the head is pressed then trigger some code, but we haven't found this in the app yet. It may also be possible to trigger behaviour based on Coji's motion sensors in future - Coji can detect when it is picked up, tilted or shaken. It would also be good to be able to control the colour of the LED on Coji's front - at the moment the colour is changed by some of the Emoji's but there's not a way to control in specifically. Custom Emojis would be fun too. Maybe we'll see more features in future. Coji is a lot of fun and is a great introduction to simple programming. Tapping Emojis is even easier that dragging and dropping command blocks and makes simple coding very accessible. There are definitely some improvements that would improve the experience and we expect that the app will be updated before Christmas. 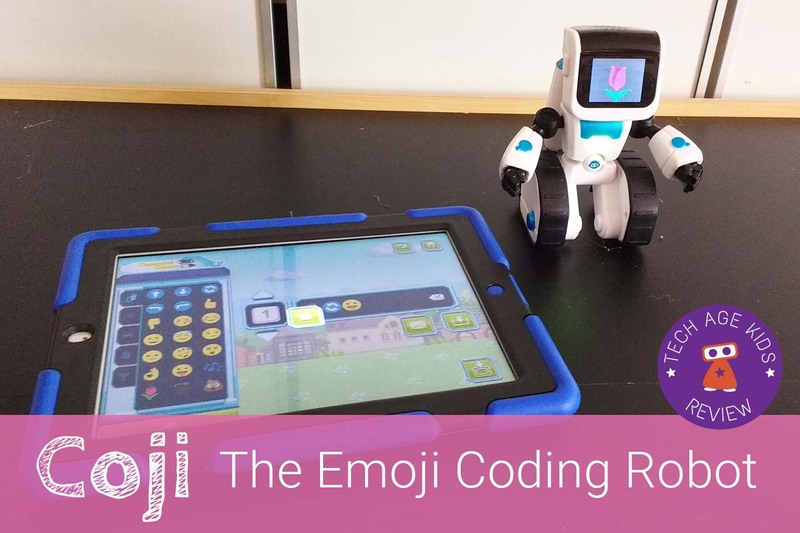 Coji's cool design and use of Emojis means that the robot will appeal to a wide age range. 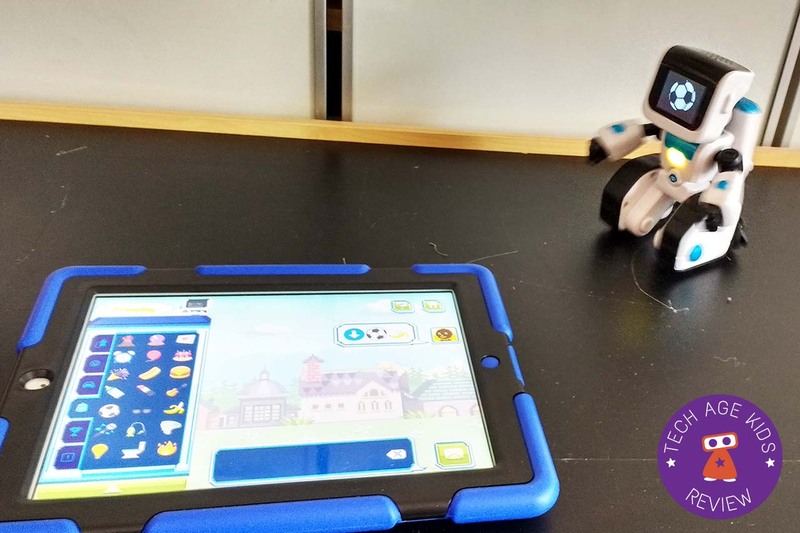 The variety of modes means that Coji has longevity, sometimes kids will feel like using it as a remote control toy and other times they'll be up for solving a real world challenge through coding. The feature to download 'macros' to Coji for disconnected play is fantastic. This will make kids feel like real programmers who can make a tech toy do just what they want. 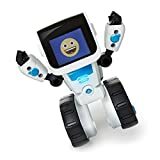 The recommended age range is 4-7, this may be because WowWee has another programmable robot targetting the 8+ age range (the Coder MiP) but I think 8-10 year olds would also enjoy Coji and have lots of fun with it.